While the community commemorates the legacy of Martin Luther King, Jr. and his dream of equality this month (original publication date, January 17, 2008), recent investigations have uncovered additional evidence of slavery in Mamaroneck’s past. Five new names have been added to the list of known slaves, which now numbers more than 80. The list in an outcrop of research presented first in a 2005 Larchmont Gazette article, which named all known slaves and slaveholders in Mamaroneck Township. The Larchmont Historical Society created a website, Slavery in Mamaroneck Township, that included additional documentation. Then in 2006, further research uncovered two more Mamaroneck slaves who appeared in a British Revolutionary War shipping manifest. (See: Two Local Slaves “Recaptured” After 220 Years). Since then, additional research unearthed references to slavery at Heathcote Hill in an 1883 essay, originally published in a collection of James Fenimore Cooper papers in 1922, and published online by the James Fenimore Cooper Society. “There were still slaves in New York at that time, and a family of them belonged to my Grandfather De Lancey. They had an easy time of it, I imagine.” So recalled Susan Fenimore Cooper, the daughter of James Fenimore Cooper, in her 1883 essay, Small Family Memories, she wrote to describe for her grandchildren what it was like growing up on Heathcote Hill during the early 1800s. The little booklet with the essay was handed down for several generations and was eventually published by one of the grandchildren – another James Fenimore Cooper – in 1922. The essay provides important new information and also raises some interesting questions for further historical research. Fred, who Mrs. Cooper describes as “a colored boy from Heathcote Hill” and as “the waiter.” Fred may be the inspiration for the image of the black man standing behind John P. DeLancey in the mural at the Mamaroneck Library which is pictured below. Harriet was described as the daughter of the cook who served as the chambermaid of the household. Harriet might be the same person that Mr. DeLancey identifies, in the Town Records in 1814, as “Harriot.” Mr. DeLancey was registering Harriot’s daughter “Anne or Nancey” as required under New York State law at the time. 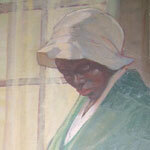 The registration allowed him to retain ownership of the daughter as a slave until 1828. Henry was described as Harriet’s son. The article also describes three other slaves in the household, but does not name them: a “fat black woman,” who was the cook and who was the mother of Harriet, and “a colored child or two.” One of the children might be “Anne or Nancey” – Harriet’s daughter. John Peter Delancey, with his wife and two of his slaves. 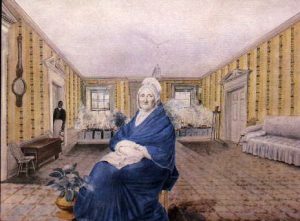 From the mural “The Marriage of James Fenimore Cooper to Susan DeLancey, 1811” painted in 1937 by Warren Chase Merritt for the Mamaroneck Public Library. Mrs. Cooper does not state outright that Joseph was a slave, but it seems likely. He must have been important in some way – perhaps he was a leading person in the community of slaves, perhaps a leader in the church. We also learn that his wife was named “Harris” and that she and Joseph lived in a house on Pine Street that she left to John Nelson. Is this the Pine Street we know today in Mamaroneck? John DeLancey gave Joseph and Harris a house – not just the use of a house, but title to a house. This suggests that, at the time, Joseph and Harris were not slaves. Might he also have freed them? Mrs. Cooper also notes that Joseph is buried in the “family ground.” Does this refer to the DeLancey Family Burial Ground on Palmer Avenue? There are old stone markers at the family burial ground – some with the names weathered away – and one of them may be for Joseph. Harris is buried “in the Churchyard near the front fence.” Is this another burial ground adjacent to a church? Our knowledge of slavery in Mamaroneck Township is extensive compared to what is known in other small communities, but the information is still fragmentary. Fortunately, people like Susan Fenimore Cooper have left local historians some interesting clues for further research. She has also reminded us, as we reflect on Dr. Kings’ dream of freedom and human rights, that slavery is very much a part of our local history.